Liverpool-based new music ensemble Immix focus on collaborations with innovative musical voices from across the UK, with an emphasis on artists from the Merseyside area. Their commissions set out to promote collaboration across the spectrum arts and music, with the aim of bringing together like-minded musicians, sowing the seeds of future collaborations. Now, in partnership with Tate Liverpool, they present a world premiere of INTONE, a newly commissioned work composed by genre-defying violinist Laura Cannell, alongside multidisciplinary artist Ella Finer. INTONE will be presented in the Wolfson Gallery, amid the new ARTIST ROOMS Alex Katz display. The new work takes its starting point from a combination of ancient and modern methods of composition: from the 15th century idea of performing vocals instrumentally, to fluxus ideas of interpretation and duration. These layers combine in an exploration of Cannell and Finer’s shared interest in the sound of languages through tone, intonation and translation. The programme will also feature premieres of new works by Immix’s composer-in-residence, Andrew PM Hunt, and artistic director Daniel Thorne. 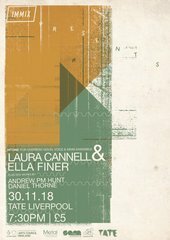 Laura Cannell has released four critically acclaimed solo albums, and has been featured in the Guardian, the Financial Times and has appeared in The Wire’s Top 50, MOJO Magazine’s Top Ten Underground Albums and the Quietus Top Albums of the Year. Ella Finer’s ongoing project Sound Politics queries the ownership of cultural expression through sound, informing her recent curated events Selector Responder: Sounding out the Archives at the British Library. She is a 2018 Sound and Music Composer-Curator and a trustee of Longplayer. Immix’s commissions set out to promote collaboration across the spectrum arts and music.